In the meantime, check out who else has been bringing home the bling this month!! Little man took home two, yes TWO, trophies from his first Pinewood Derby. My Dad helped him build the car and the axles. He helped him add weight and get it painted. We helped him get he’s desired design of a Wii-mote perfected. 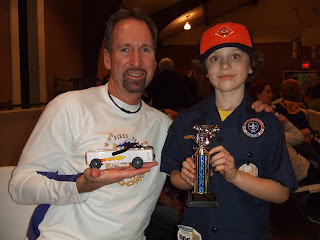 The little booger walked away with the trophy for best design and for being the fastest Tiger Cub! He earned a spot to go on to a district competition. Must be rough being the best at everything! Judah and His Pit Crew! The day of the derby it was a rare 70 degree January day, two days later it was a record low of 3 degrees and so much snow and cold that school was canceled for 3 days straight! All of this took place while my running was being seriously effected. Not so much by the weather though. The longer story, I’ll get to next is about my new adventures with a torn calf muscle. Stay tuned, it’s good one! The little man knows how to be fast, just like mommy. Sorry about your calf. I saw you allude to it on Dailymile. Were you pushing too hard? I'll wait till next post. I'm currently battling a minor case of runner's knee myself.